Among any and all creatures in this world that could be considered living, including people, there is an universal truth: We die. But not all of us go through the gradual (and eventually rapid) process of self-destruction that we think of as aging. Some animals and plants, like species of jellyfish, tortoises, and trees, seem to have a sort of biological immortality. 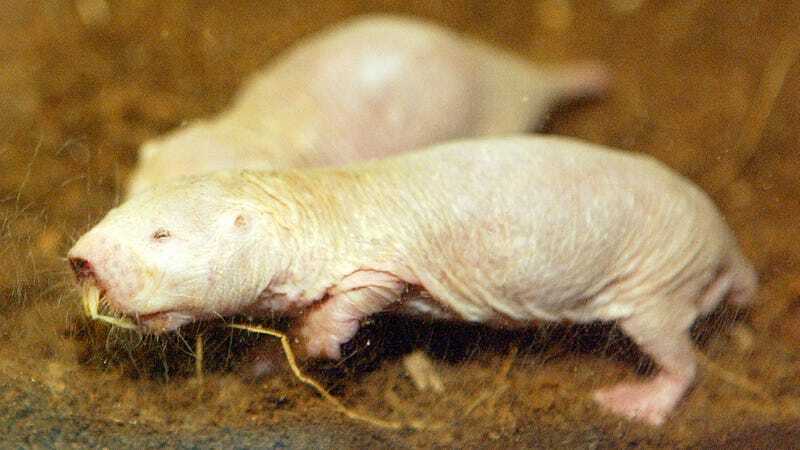 A recent study published in eLife provides more evidence there’s at least one more animal we should add to that list: the naked mole-rat. Scientists at Calico, a research firm under the umbrella of Google parent company Alphabet, have been studying more than 3,000 mole-rats for years. Armed with detailed birth and death records, they created a model of how likely an individual rat would be to die at any given point along its lifespan. Rats did die every so often, but the researchers couldn’t find any spike in the risk of dying as rats got older. The oldest mole-rat at the end of the study period was a smidge over 30. For context, similarly sized rodents in captivity could be expected to live around six years or so—a number that the oldest mole-rats today eclipse five-fold. What’s more, a typical six-year-old rodent would show signs of aging and would have lost the ability to reproduce. Meanwhile, Calico’s oldest female mole-rats are still perfectly capable of giving birth, since they haven’t undergone menopause. “This is the first mammal in which there is a lack of intrinsic mortality with increasing age,” study author Rochelle Buffenstein told me. Scientists, including Buffenstein herself, have detailed this sort of impressive longevity with mole-rats before, but this is the first study to rely on a large, detailed sample. Mole-rats live underground in large burrow systems, as part of a colony that can contain hundreds of animals, with one to three females and a select few males responsible for breeding at a time. According to Buffenstein, what makes mole-rats even stranger is that female rats responsible for breeding actually seem less likely to die than non-breeding rats. That would make them an exception to the “disposable soma” theory of aging, which theorizes that organisms only have a finite amount of energy to spend on important biological processes like reproduction. Over the 30-year-span they looked at, only around 400 mole-rats actually died of natural causes. “[W]e see animals die with signs of periodontal disease, kidney disease or muscle wasting, but this can occur at any age,” Buffenstein said. They also seem to only very rarely develop other age-related diseases, like cancer. And their behavior largely stays the same as they get older. All of which suggests to Buffenstein and her team that naked mole-rats could theoretically live as long as they’re lucky enough to avoid disease and injury. They also admit that there could be an upper limit where age starts mattering to mole-rats, but if there is, we haven’t seen the number yet. The oldest mole-rat they have now is a 35-year-old male breeder, and Calico scientists plan to keep an eye on it and its long-lived compatriots as long as they humanly can (Buffenstein has kept her own colony, first obtained from Africa, for many years throughout her various jobs in academia and now at Calico). They and other scientists are also diligently doing research to try to suss how exactly the mole-rat pulls off its longevity trick, and whether any of it could ever apply to humans. Any discoveries Calico could make might not be as eagerly shared as you’d think, though, at least for a long time. The Google-backed research and development company, founded in 2013, describes its mission as harnessing “advanced technologies to increase our understanding of the biology that controls lifespan.” But Calico has been unusually secretive about its ongoing and planned research projects, both with the public and other scientists.